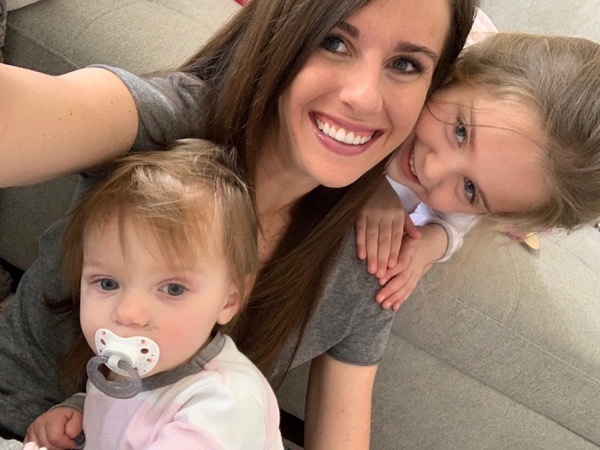 In the middle of the night on Monday night Brooke threw up and then on Tuesday morning Skye threw up so we stayed home to get these girls feeling better. Luckily they both seemed to feel better pretty quickly after they threw up but they were both very tired so there was a lot of snuggling (and more crying than usual too). For a few minutes I thought I got sick too until I realized it was just from being around it all ha. 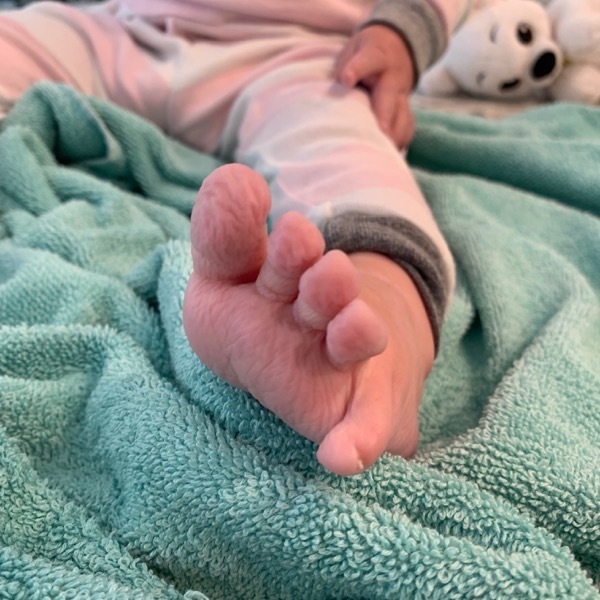 I love her little pruney feet after a bath. I jumped on my treadmill later on in the day during naps. I had a speed workout on the plan but I decided to get in some hills instead. I usually stick to plans like glue (and I do 100% with a coach) but I just felt like I needed some good hills instead of speed so I went the same distance as my plan but played around more with the incline than the mph. During my run I watched this documentary below. It features the top women competitors for Western States in 2016 (I’ve posted this one before… that’s how much I love it) and it made me even more excited for my race. I love that we have so many incredible women runners that we can look up to right now. For the last 20ish minutes of my run I spent time just thinking about my goals for race day. I really want to push myself in those final 15-20 miles. Game plan = take the first 33 very conservative and then let my competitive side out in the final few hours (if possible). Why not dream big? The more I picture great things happening on race day, the more they happen! PS did you see that the indoor mile world record was broken… SO FAST. PPS I’ve had a few people ask how my sister’s running is going so here you go—> As our runs got longer when we were training for her half marathon her back wasn’t loving it (she has had back surgery and A LOT of pain over the years) so we stopped doing long runs. At the start of this year she switched up her routine and her body is very happy with it as a result. I think the key to exercise is finding whatever movement makes your body and mind happiest and that is what leads to consistency. She goes to this 5-6 times a week and loves it. 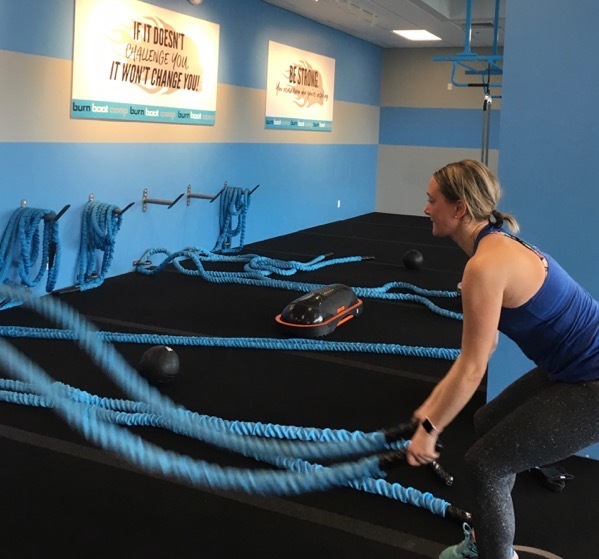 Those ropes while standing on the bosu ball are evil. It’s been fun making good friends (this is our friend Kerry:) at class too… it’s quite the community. Back to Tuesday… This was my best friend yesterday. I really do not want Andrew or Knox (he comes back today) to get this bug so I Cloroxed everything. Brooke is hooked on knitting. She can do it all by herself now without any help from me… I love seeing her find her little passions. Most of my meals included cold leftovers (sometimes leftovers taste better cold… I know, I’m weird) and my favorite bowl of happiness right now. 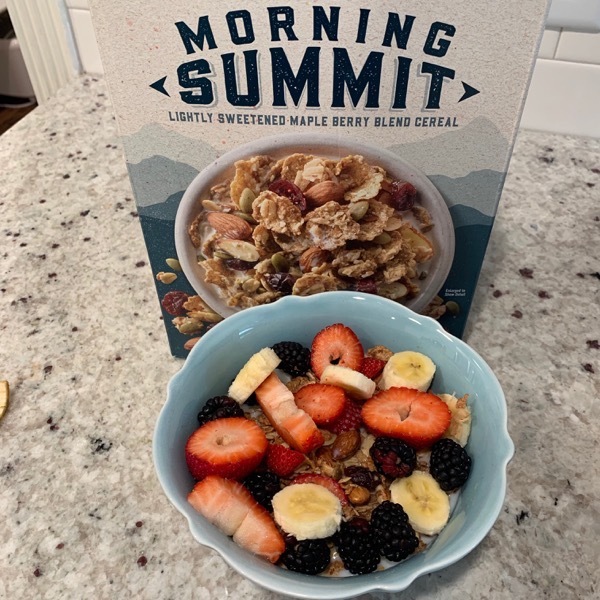 This cereal + almond milk + fruit galore. We did leave for a short walk yesterday. The fresh air felt so so good. 1 more shift + 1 more test… HE CAN SEE THE FINISH LINE! For some reason I just wanted to post this for any of you struggling with time away from running or an injury. So much truth below and I think this is why we all relate to each other online. Does my sister’s husband’s phone stress you out or no big deal? -Stressed out to the extreme. I want to go through his emails for him. Who are some of your favorite elite women runners that you look up to? Has strength training helped any of you with aches/pains? -I haven’t been doing bootcamp that long or as much as my sister but I am noticing my core and glutes activating during my runs and it’s a good feeling… I think it is going to make a difference on race day and I can now see a little line on my arm that might actually be a bicep;). Do you stick to your training plans like glue or are you open to switching things up? Why We Run so Much Better on Race Day vs Training + Haircut + What happened?! I love Shalane Flanagan! I have both of her cookbooks, and they’ve really helped me improve my nutrition while getting plenty to eat. I really admire her running and her attitude towards food! YES I totally agree (and I need to get her second cookbook)… I love how she approaches food/training. She is pretty incredible. Have a beautiful day Isla! SO excited for Andrew!! What a huge accomplishment, and it’s so encouraging to see him chasing and achieving his goals! So proud of you and how far you’ve come, Janae! You’re definitely an encouragement and inspiration to us all! GO ANDREW!! :D You’re so close! Lately I’ve been such a huge Allie Kieffer fan! I love her body positive messages and she has a lot of grit. I’m in the last few weeks of a marathon training plan and I just finally started doing some stretching/foam rolling and hip/glute exercises last week (I’ve been telling myself I need to do them for ages but never really made time for it until now). It’s not easy because I have a 7 month old and I work full time too, so I’ve been sacrificing a little sleep to make time for it. But it definitely has been worth it, because I feel SO MUCH BETTER now! I feel more springy, less little niggling pains/things that just feel off. I feel faster too – I did speed work last night and I just felt so much more power, I think because the fact that my glutes are more activated. It’s crazy because I already knew that doing these things would have such a positive effect, but I feel like I have to re-discover it every training cycle…gahhh. Why do I have to re-learn the lesson every time?? I’m actually pretty flexible when it comes to training plans! I’m okay with waiting for a workout until the next day if I’m not feeling great/just feel like I need to recover, and sometimes I just feel like my body wants something besides what’s prescribed. I’ve always gotten good results from trusting my body! Have a great day, Janae and family! I hope Brooke and Skye get back to feeling 100%! You are not alone Kelly… I do that each training cycle too. You are very busy and huge congrats on your marathon coming up and all of the training you have been doing. I agree, Allie Kieffer is incredible. Thanks so much Kelly and I hope you are having a fabulous day! Allie Kiefer, Shalane Flanagan, Stephanie Bruce, Desi Linden, Kara Goucher! Allie and Stephanie share a lot of their training on Instagram, which is so inspiring to see! Shalane Flanagan is a def favorite (hometown hero for me!) , Kara Goucher (love her representing the moms), Des Linden (she just seems so laid back and cool ((which I am not lol )). and you! 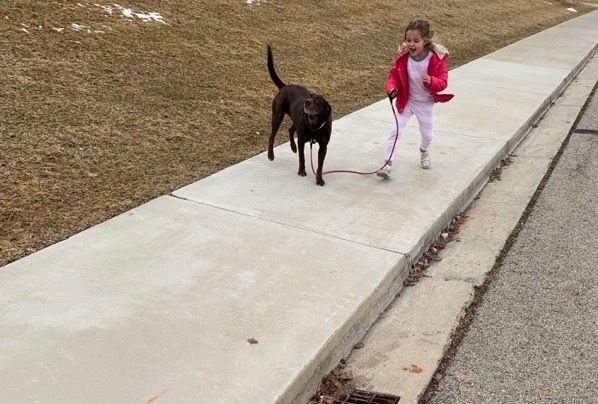 Seeing you head out to run everyday with little ones helps push me out the door as well. Also love how positive you always are! Wish I could say I strength train.. I don’t, I know it’s awful and I need too. I don’t know why I am just not into it and always feel like I am doing it wrong so I just skip it haha. I mean maybe I do strength train? I can pick my three year old and one year old up at the same time?? I really try hard to stick to my training plan, but life happens sometimes. I had a run planned for yesterday, but my kids also have the stomach bug/virus whatever it is and I wasn’t able to get out the door, however, I did manage to shower my house basically in bleach in hopes that my husband and I don’t get this bug. Andrew is so so close!! AH so exciting!!! Yay for Andrew!! Almost done! And yay for your sister, that she has found an exercise that is good to hear body! I am loving following the elite US women runners. They are amazing! Through their highs and lows, they are some pretty amazingly strong women. Ugh I hate stomach bugs! I’m glad you guys are all feeling healthy at your home now and I hope it stays that way! I feel like I need a personal Janea at my house to help me keep our kitchen clean. I hate a messy kitchen but I feel like for some reason ours is really hard to keep clean. I really loved the gym class I went to with my mom. I feel like I worked way harder in a class than I do on my own most of the time. But I have learned my lesson about strength training being important for runners! I mix things up constantly, due to chronic subtalar injury in my ankle. 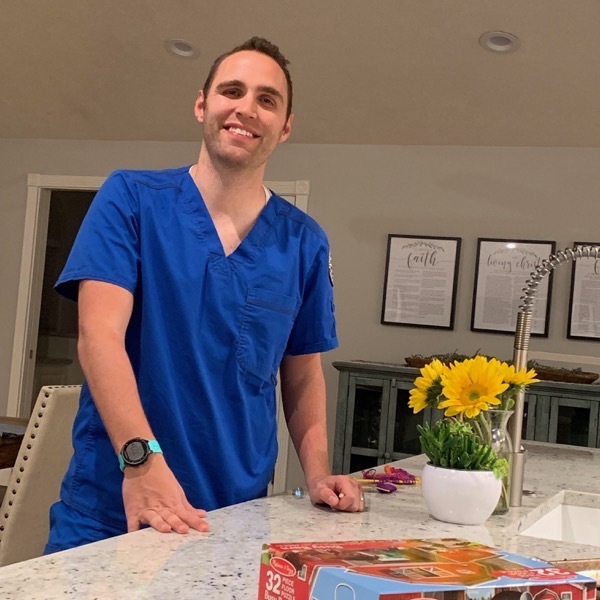 My daughter and husband have both had back surgery and they asked the surgeon what exercise populations they see the most: runners and crossfitters. Runners because they tend to be monolithic in their training and crossfitters because some of them attempt far more weight and reps than they should too soon. As I’m heading to 50 (😅🤭🤦🏻‍♀️) my interest has become much more being able to stay healthy and active as long as possible as opposed to distance or times, so I “consistently mix things up”. I wish I did stick to my plan better than I do, that is my goal for this cycle is to be better about following a plan. I think it’s good to modify when needed but to stick to the plan as much as possible. I am always impressed how diligent you are with your training! YAY for Andrew (and you) I hope his capstone and finals go well! Good morning Janae! Glad to hear the girls are feeling better and that it was a quick bug. 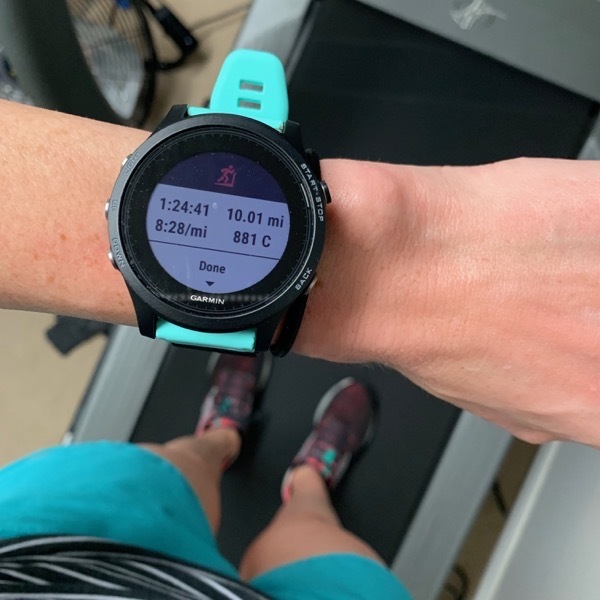 Remember when you started this ultra training and you hadn’t been running much on the treadmill for marathon training so you were like my treadmill tolerance is gone! Well look at you getting in a 10 miler on the treadmill on a Tuesday;) Way to go! I really loved that it said the indoor record was broken by Kejelca after him missing his goal twice this season. That is so encouraging for people who miss their goal and feel like its not in them (aka me haha), but try again and BOOM you got this. After my half last weekend my body is still not recovered; my coach had me resting until a short recovery run Friday but we may take more time because I just want to feel excited and ready to get back to it, not to check off a training run. It shows how hard my body worked even without hitting my goal. Also me and my boyfriend got engaged on Saturday after the half marathon;). so that’s all the updates in my life on this Tuesday. Have a lovely day, Janae! OMG YOU GOT ENGAGED!!! CONGRATULATIONS! ELEANOR!!! AHHHH CONGRATULATIONS!! I am so so excited for you. Such a fabulous proposal… after your half marathon. I’m just so happy for you! Yes yes yes, keep showing up and it eventually happens. That is so true, I’ve built up that tolerance again… go me:) . Have a beautiful day and keep me updated of your wedding planning! Where do you find that cereal? It looks amazing!! I have looked for it in several spots but I can’t find it. HEY!!! I found it at Costco and it is amazing. Do you have a costco membership? 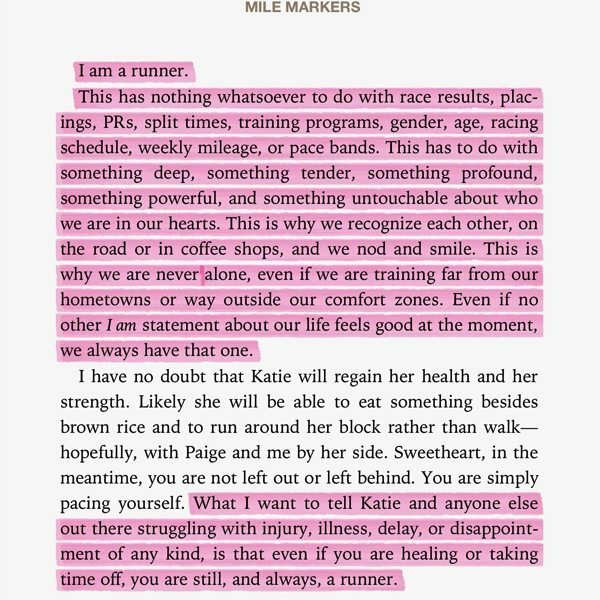 Three things: that quote from Mile Markers literally made me tear up!! So applicable to my life right now. I watched the little documentary you skated about the Leadville 100 yesterday on the treadmill, so today I’ll watch the one you posted today! Oh I am so happy you are watching the documentaries… SO so good and they are making me cry on the treadmill. Thanks Amanda and you’ve got this. YOU ARE A RUNNER and you always will be. Something that’s made a huge difference in my fitness level has been finding a gym where the trainers are happy to modify movements for me in the group classes. Since joining this gym, they’ve helped me through three (!) calf strains, an oblique strain, and a bruised rib. So congrats to your sister for finding a gym that will work with her injuries and encourage her to work safely! Good to know. Emily, I am SO so happy that you have found that gym. It makes the biggest difference. Have a beautiful day! I’m so sorry you have sick kiddos!! That’s the worst! Mine are both down with colds right now but we had the stomach flu come raging through our house back in January and it’s not fun! I hope everyone is back to 100% soon and hopefully you and Andrew steer clear of the germs! 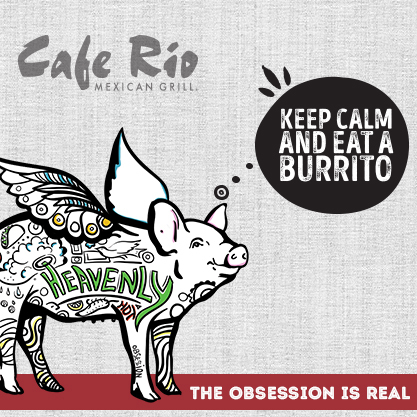 I fully agree with you on this and I wish I had some more cold leftovers right now. 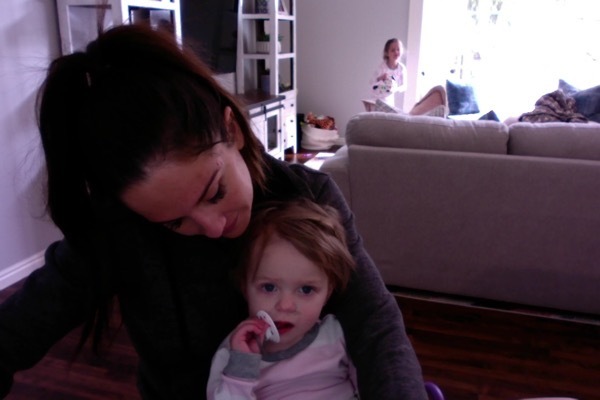 Oh I hope your kids feel better soon too… it’s so hard to see them sick. Thanks Torrie! 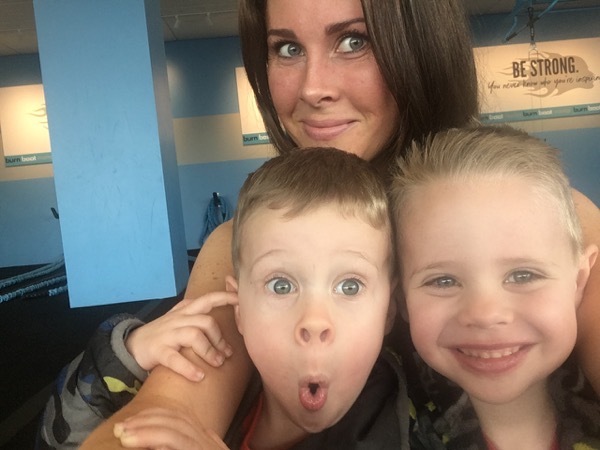 OMG Janae this post is full of so much goodness (except for the girls getting stomach-sick…at least it was a sort of ‘one and done’ thing for them instead of REPEATED biofluids coming up for days on end?). I’m sending BIG BIG BIG High Fives to Andrew and your sister for their progress and dedication. That’s pretty amazing. I also love that passage you highlighted in bright pink and shared on here. It’s wonderful. 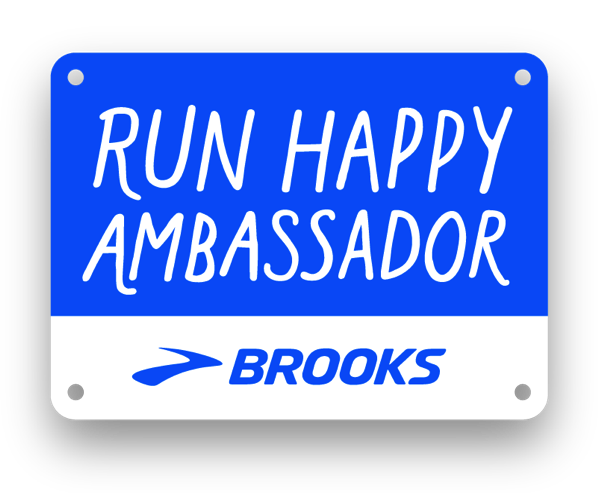 I love how a passion for running and one’s identity as a runner can look SO DIFFERENT from someone else’s, but it unites all of us. What a beautiful thing. And imagine how beautiful and connected our entire world would be if this thing with running was an example of how we should all live–look for the spark of recognition of SOMETHING that’s part of your identity in the people around you and wish them well into this world, instead of looking for that spark of difference and hopping on a soapbox over it? And if we each have different and overlapping sparks of RECOGNITION in this world, then we create a beautiful woven tapestry. All of the things that are different merge with all of the things that are similar–and whether it looks like a unified image, like a Monet painting, or an abstract mishmash of so many different htings like a Jackson Pollack painting, it all has the power to be perfectly beautiful exactly as it is. Our human, worldly, international tapestry. WHat an amazing idea. Those email notifications would stress me out. A SMALL number in a red balloon–ok, fine, maybe someone’s busy–but THAT MANY? Is someone avoiding something? Or is someone so incredibly busy that they need an assistant to help them out? How can we all help? I wish I was in Burn with you and your sister. When the job and money stuff evens out I think I am joining the one by me if my budget looks like it can POSSIBLY make that work. I really loved those early morning sessions 3x/week!!! Yay Andrew!! Such a huge accomplishment! So glad everyone is feeling better. I love that Brooke has already learned knitting. I want some PJs like hers. I also like Emma Coburn and Colleen Quigley. I love strength training! I think moving your muscles in way that’s different from running really helps my running. I just don’t feel as good when I have to skip my weight training. I stick to my training plans. Sometimes life or weather gets in the way and I have to move things around, but I always do my workouts. I’ll have to watch that documentary, I always appreciate a good running documentary. Plus trail running fascinates me. As someone who struggles running downhill, I always feel like I learn so much from that sort of thing. I think my favorite elite runners are Steph Bruce, Desi, and Marielle Hall. Marielle Hall is a “bowerman babe” but not as well known. She’s incredible and grew up where I live now. I’ve met her a couple of times and she is always so nice. OMG please steal his phone and start deleting emails! I can’t handle that. I strength train at least once a week with weights and then try to do Pilates/Yoga on another day. It definitely makes me feel stronger and I need a strong core or my back will start to hurt like crazy. I totally stick to my plan as much as possible. Sometimes I might need to switch my days but I will definitely do all the workouts as prescribed. I sure hope no one else in your house gets sick! And your sister is so strong. Planks on TRX bands are hard! We all had that stomach bug a month ago. Ugh! I sure hope it doesn’t spread in your family. 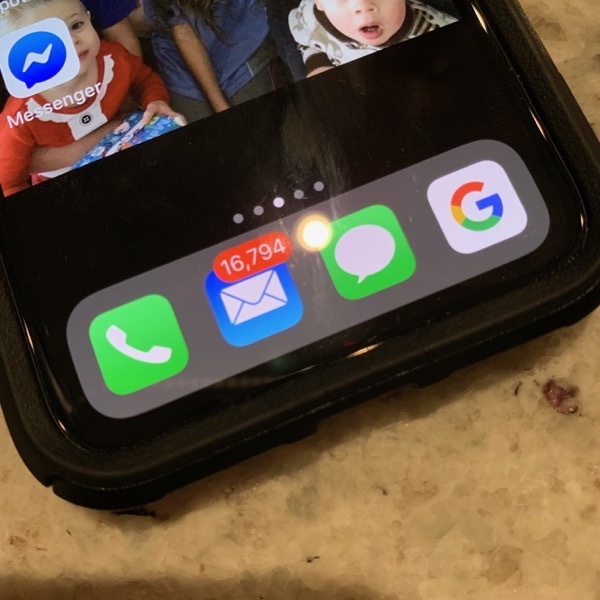 My husband has 39,000 new emails on his phone and it drives me crazy! I think your plan of 33 miles conservatively (that sounds so funny) sounds great. I find that in the last 15 or so miles of an ultra, I’ll have very high highs, followed by very low lows. I have a really sensitive stomach, so sometimes that bothers me later on in a race. I usually find that once I hit the point of having single digits left, I’ll pick up the pace from a little adrenaline rush… but then my body forces me back into a bit of a trudge every now and then. Remember, this is all new for you, and you basically jumped from a huge marathon PR into the ultra. I say that just to further encourage you to take it easy :) You’re going to do great! And, yay Andrew on approaching that finish line of his own! Stacey, can I have you call me on race morning to remind me about some of these things;) . But seriously. Thank you Stacey and the fact you’ve done these ultras with a sensitive stomach is unreal to me! I think you need to take over your husband’s phone haha. Thanks Stacey and have a wonderful day! I’m so sorry your girls caught the bug but YAY that it lasted only a short while! If I have 1 notification on my phone I have to check it! Now … when I felt like my settings app was sending me too many notifications, I just moved the app to a screen I don’t check much! Ha! My current favorite runners are all ultra trail runners; Courtney Dauwalter, Ladia Albertson-Junkans, Kaytlyn Gerbin, Kaci Lickteig, Ariel Boone …. I love strength training and after a few too many injuries as a direct result of not strength training, I will never ever ever skip doing it ever again! I say that now …. ha! It’s just so hard to squeeze in if/when training for a marathon or anything longer on top of kids, work, family etc. I let it go big time during my last marathon training cycle in the summer and I’m still paying for it! Oops! I DO THAT ON MY PHONE TOO… I can’t stand seeing notifications and not doing anything about them. Thanks Jenny, you too and way to go on getting in the strength with everything going on in your life! HAHAH I will definitely tell him:) . That quote really got me this morning. I got pregnant in 2017 and stopped running around 20 weeks. I started back again around 7 weeks pp, then had an unexpected surgery at 9 weeks pp, so waited a few more weeks and started running again, then decided it was best for my body (and sanity) to wait until I was sleeping a little more/nursing less. Then I got pregnant at 6 months pp and am now almost 20 weeks pregnant and looking at up to another year until running is back in my life. That’s more than two years without running consistently, and part of me has wondered if I’ll ever get back to it, but then I drive a windy back road and think how great it would be to be running 😆. I am a runner! Thanks for the reminder. Leah…. HUGE congrats on your pregnancy and I hope you are feeling well. You are 1000000% a runner. Don’t forget that again. You have had a lot going on and you must be so busy with these two so close together. Keep me updated with how you are doing and running is always there for you when life is ready for it. I had an injury after having Hope which has caused me to not be able to complete training plans. After I rest and strengthening I always try another. I am currently in a plan without a problem………fingers crossed! But if it ends up to be a no go in the end, all will be well. I have learned when I need to back down the milage now, so I can keep running without a beat, and that is what really matters most for me at this point. I always get the pyschosematic queasiness when someone has a stomach bug. Chris says I wash my hands like I am going into surgery. Ha. Crossing all of my fingers… this is so exciting Erica! You are so smart about your training. Hahaha I was doing that yesterday too. Thank you so much and they are wahoo. I do a boot camp style workout 4 or 5 days a week. It has been great for my body as I get older. Having a strong core, hips, glutes, and all of the other muscles are necessary to keep doing the activities that I do. I run 3 days a week and bike 3 days a week. I double up most days so that I can get a complete rest day each week. I can’t stick to a schedule and I don’t know why. I will have the time and the energy, I just can’t do it. Even when I am driving and put my destination into my phone, I will change the route. I will not follow the directions Sir gives me. This must go back to my childhood somehow I’m just not sure how. Hahaha this sounds like Andrew. He does not like routines and following things either! Way to go getting in all of the strength work, it is so good for us. Have a wonderful day megan! Allie Kieffer and Des Linden are my favorites. I’m training for Boston and go to a boxing/strength class twice a week. I believe that for me, that class is keeping me from getting injured and I’d rather go to that class even if it means choosing it over a shorter mid-week run. I love having a plan but I don’t stress to much if I have to change things up. The weather is out of my control so I have to be a bit flexible. And sometimes I have to listen to my body when it’s tired. As long as I don’t miss the long run, I feel like the rest of the week can be a negotiation. 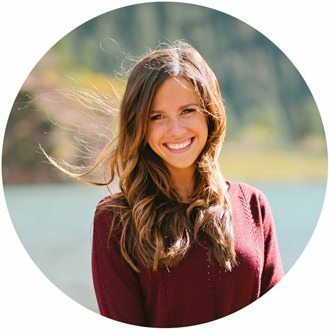 Janae, I am so thankful for what you’ve been posting about injuries and recovery lately–I really need to see and hear that! I really admire Shalane and Emily Infeld for elite runners–Shalane because she’s Shalane, and Emily because she seems so fun, yet smart and dedicated–and because she’s also recovering from injury and is recovering like a champ. I have never in my life followed a training schedule! 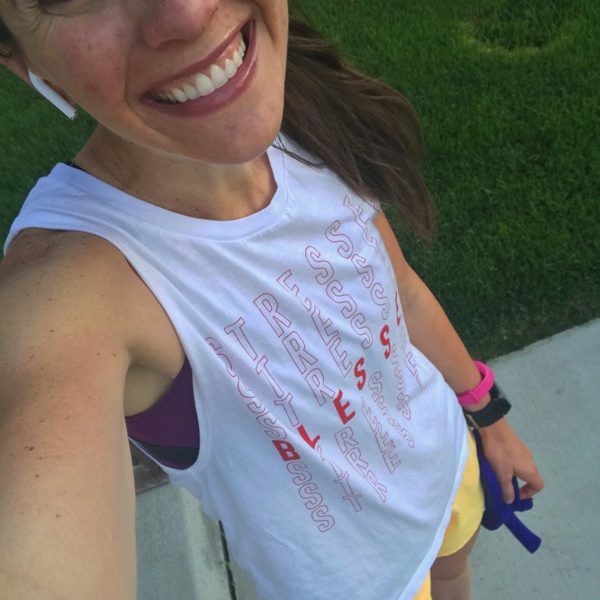 I am probably way too loosey-goosey about it because I’m always thinking “I should listen to my body!” So usually I’ll think, “I need to do an interval this week, a long run, and a third run,” but I’ll decide day of which run I’ll do. Strength training has helped me so much! I always try to do a few planks as part of my warmup to help activate my core during a run, and having strong abs, glutes, and hips makes a noticeable difference. Our bodies can do such amazing things and I think strength training helps us see that. Oh Kristin, I am so glad they helped! YES to strength training helping so much.. I’m excited to see what it does for me. Have a beautiful day and I think you are training just the way you should! Have a great day, Janae!!!!!! You motivate me big time to get in strength training! As I am doing this I’m realizing that running has only really built up a few of my muscles and like you said… those non-running muscles need strengthening too! I agree, Des is the best and I love Jenny Simpson too. Thanks Jen, you too! Running heroes: Kara Goucher is the reason I started running, she will always be my first run hero. -Beyond her, I love Des Linden and Steph Bruce. Wow, 20 unread emails is the max I can tolerate before losing sleep, but then again there must be a point where you have so many that it just doesn’t matter anymore so it actually becomes less stressful. I feel like I could get used to that. At the risk of sounding crazy, I really really hate the stomach flu so have spent way too much time trying to figure out how to never let it enter my house or spread if it does enter the house. 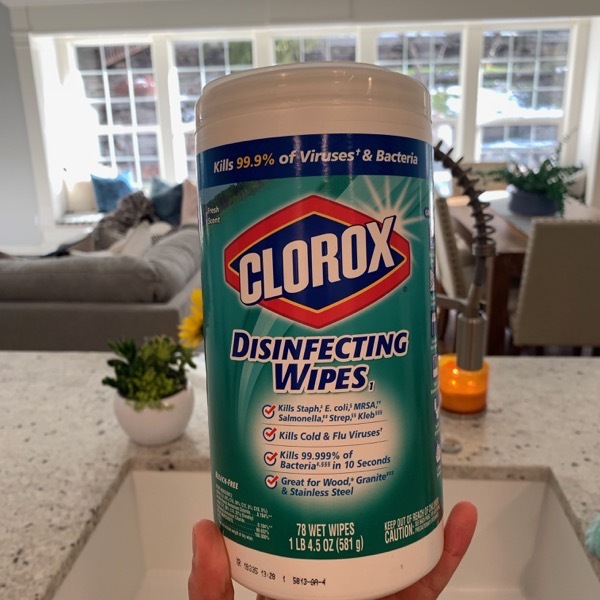 I think the wipes you used will kill everything but the stomach flu… usually the best bet on that is to stick with 90/10% water/bleach solution and then you have to let it sit wet on the surface for about 30 seconds before wiping it up. I know, I sound crazy, but I just can’t help myself. You don’t sound crazy at all… this is extremely helpful so thank you Kim! That is so cool that Kara Goucher is the reason you started running! Haha I think he is at that point:) . Have a wonderful day! I have a question for you. Does your Garmin match what your treadmill says, as far as mileage? Mine is extremely off. My treadmill says I’ve run a mile but my Garmin has only tracked 0.75 miles. I’ve heard that if you haven’t done a lot of outdoor running with your Garmin, they won’t match up, but I don’t know how much truth there is to that. Just curious what your experience has been. Hey Madeline! I think it depends on what Garmin you use. Mine is pretty exact with the gym treadmill but my treadmill at home is having problems with the software and it is all over the place so I am going off of my watch at home. My Garmin had me calibrate it the first few runs on the treadmill too so I think that helped. Let me know if you have any other questions, have a great day! That phone made me itch! Someone go through those messages! Hahaha I know… I might take it upon myself to organize it for him this weekend. 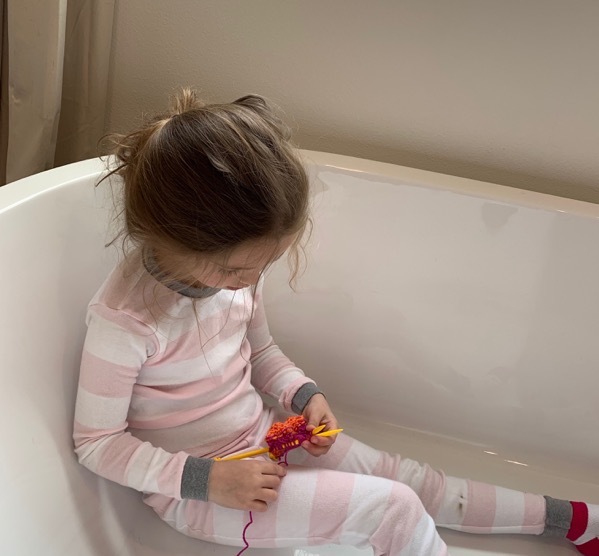 Well now you need to try knitting in the tub because Brooke said it is pretty fun. Have a wonderful day Samantha! Hey I have done Burn before but I’m just curious if you pay for it monthly and just go a few times or does yours offer other rates, too? I feel like I can’t get enough in to justify it monthly but I did love Burn! Hey!! It is monthly here too! My plan after this ultra is to go 3-4 times a week but I totally see what you are saying. I hope you have a wonderful day Heather! Poor kiddos! Hopefully they are back to normal soon. I loved knitting and sewing at Brooke’s age! We also used to buy those cute little latch hook projects at Michael’s and they would keep us entertained for hours. Thank you so much for posting that “I am a runner ” excerpt. I really needed to read that today. I am currently 10 weeks pregnant but have had two previous miscarriages. I had a scare on Saturday evening and went to the ER but everything was fine. I am supposed to be taking it easy which means I cannot run and running is such a huge stress reliever. Even if I can’t run until after the baby is born it will be totally worth it. Anyway, I just wanted to say thanks for the post and all your positivity. I hope you guys all feel better soon! “I really want to push myself in those final 15-20 miles” – I hope you realize how crazy that sounds to an ordinary mortal!! :D I’m sure you’ll absolutely rock those final few miles! But if, for whatever reason, things don’t go quite according to plan, I really hope that you’ll remember to practice what you preach and *not be too hard on yourself*. Whatever happens on the day, everyone – your family, friends and all your readers – is going to be incredibly proud of what you’ve accomplished! Best of luck and we’ll all be rooting for you!